In 2012 the office at Commonwealth Games Scotland received a curious package. Inside was a piece of Games history that had been missing for more than four decades. When opened, the package contained the official flag of the British Commonwealth Games with the linked chain and royal crown insignia, and a red, white and blue trim, a reference to the British flag. This particular flag had first been used at the 1958 Cardiff Games, then called the British Empire and Commonwealth Games. In 1966 the Games changed name again to the British Commonwealth Games and the flag was clearly altered to fit the new title. This flag flew on the North West corner of the Meadowbank Stadium at the Commonwealth Games, held in Edinburgh in 1970. At the time I was a couple of months short of my seventeenth birthday, and I had a summer job with John Menzies & Co who had kiosks situated in the various sports venues. The flag was “liberated” by me with assistance provided by a tall boy scout. He held me whilst I stood on the edge of the stadium and reached to cut the rope to release the flag. In return for his assistance I provided the extremely sharp pen knife and support for him to free the adjacent Saltire. We then both ran, chased by a security guard who luckily was no where near as fast as Ian Stewart or Ian McCafferty who we had just seen taking Gold and Silver in the “5000 Metres”! The flag has been returned to the Commonwealth Games Council for Scotland, on Burns Day having been “borrowed” for just under 42 years! We are delighted the flag has found a home in our Commonwealth Games Scotland Archive. This item, with such a rich story to tell, is included in our touring Hosts and Champions exhibition which celebrates over 80 years of participation and achievement by Scotland in the Commonwealth Games. 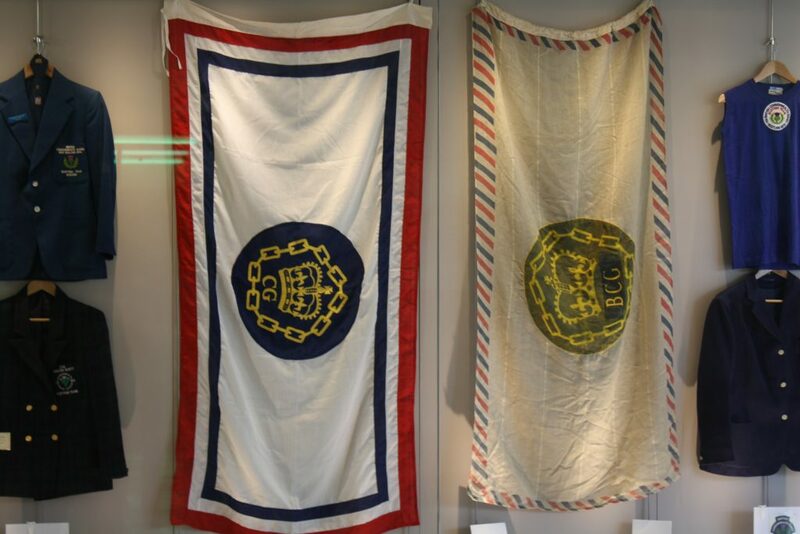 The flag returned by ‘DG’ on the right alongside another more recent example of the Commonwealth Games flag.